Going out on location can be quite fun and as each place is different it never gets boring. 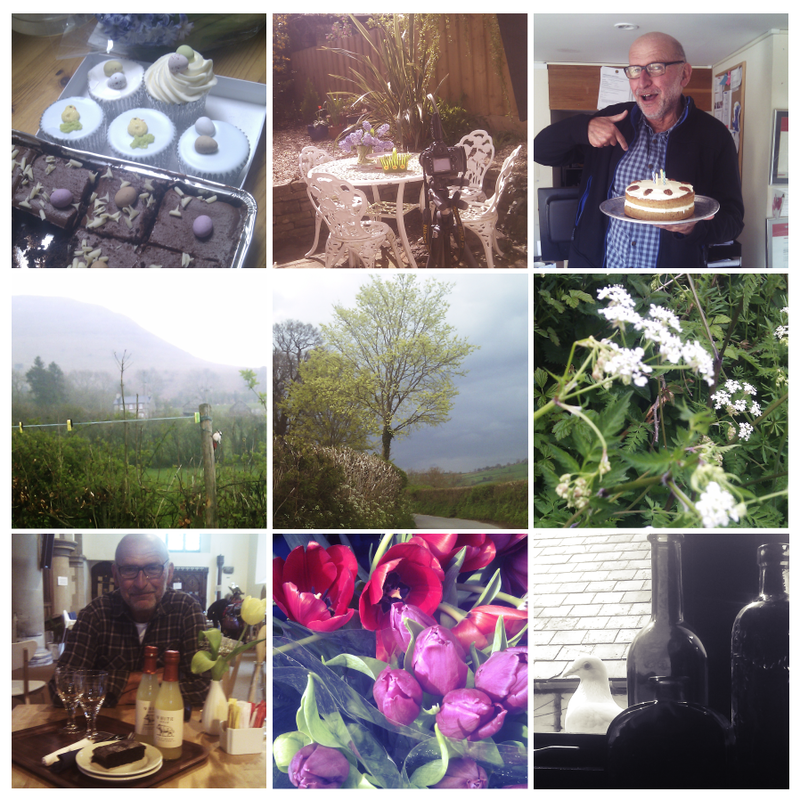 As I have been to so many places recently, I decided to create a little photo diary of what has caught my eye recently and a few quick snaps of life behind the camera. 2. Garden at Bookend Cottage building a little story, so lovely and sunny, I hope the chocolate eggs don't melt. 3. Happy Birthday Mr Paul Campbell! Quick cake before we headed out the door to shoot Y Bwythyn Cottage. Dedication. 4.Woodpecker on the washing line up at a cottage above Llangorse Lake. A regular customer. 5. On my walk home: trees coming in to leaf, time to think of doing some exteriors. 6. Cow parsley- always reminds me that summer is right around the corner! 7. Sir Paul and I sampling the delicious salads and paninis at the Tower Cafe in St Mary's Church in Brecon. Free Wifi and a nice place for little kids, very peaceful. We had a gluten free Chocolate Brownie too! 8.Tulips From Amsterdam. Ready for shooting at the latest NEW cottage- Aber Farm Barn Old Hay House. 9.Friendly Doves that sit on my window catching the afternoon rays, never quite sure if they can see me, or what they think of me on the other side of the window.